The Big Wobble: Lightning storm wreakes havoc in Dunedin New Zealand! Manhole covers reported as lifting in the deluge. Lightning storm wreakes havoc in Dunedin New Zealand! Manhole covers reported as lifting in the deluge. 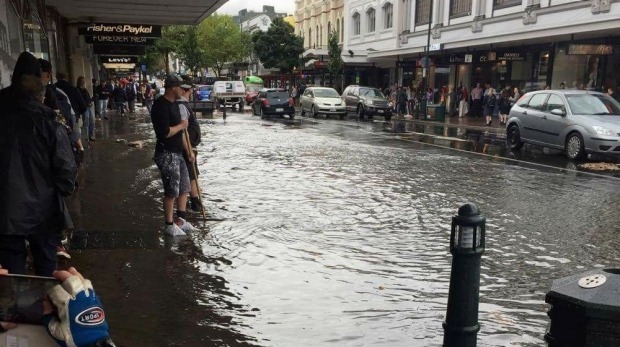 A lightning storm has wreaked havoc in Dunedin, with surface flooding and lightning strikes forcing shops to close. Locals ran for shelter as the storm struck mid-afternoon with heavy hail and torrential rain battering the southern city. Some manhole covers were reported as lifting in the deluge. Several shops on George St have closed due to flooding, with the city's main retail street lined with hail. Firefighters have been kept busy, with several call-outs to water entering buildings. Fire spokesman Andrew Norris said the fire service attended 45 call-outs, most to commercial properties in Dunedin's CBD. At one point every fire truck in Dunedin was committed in the city. "There is no significant damage," he said. One Dowling St worker, who declined to be named, said water cascaded down the four storey building into their ground flood premise. A Dunedin City Council spokesman said the city library was temporarily evacuated after water caused light fittings to short, setting off the fire alarm. "We've had lots of calls from individual business from George St," the spokesman said. "Many stores have been cluttered and we've had flooding in all sorts of places."